Since the Mass Effect series lets you not only select the gender of your character but also customise their appearance, it's interesting to find out some statistics behind the choices people make when forging their story. Speaking with VG247, BioWare's David Silverman says that 18% "of everyone who plays Mass Effect" uses the female version of Commander Shepard. So, a little under one in five. 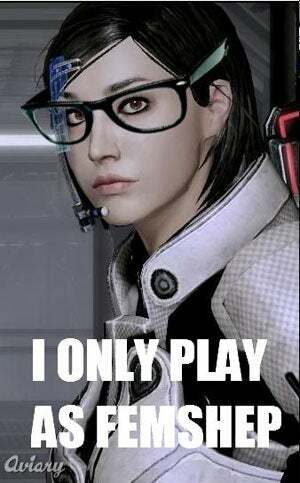 Just as interesting, given the fact their "faces" are splashed all over the game's marketing, is the number of people ditching the default character profiles and creating their own Commander Shepard, something 87% of players do when starting out on their quest.